This week, Kathy is chatting with Kate Gilbert of Twist Collective all about the newest collection we’ve put together for May 2018! This issue has everything you’ll need to take you through spring and summer, from eye-catching shawls to comfortable cotton tops, perfect for keeping you cool. Check out some of our faves! We love Montpelier, knit in Prism Merino Mia Private Palette New England Spring – an exclusive WEBS color palette! Check out Kate’s own pattern -the Bette cardigan knit in Juniper Moon Farm Zooey, which is on sale this month during our Anniversary Sale! 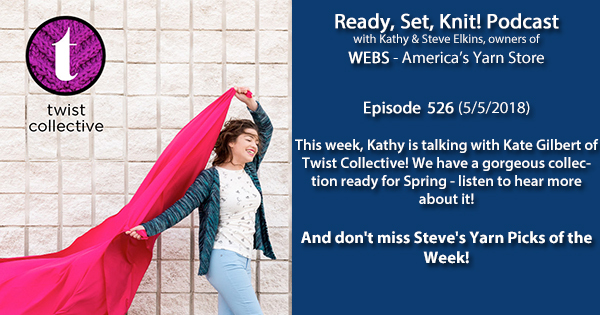 Listen to Kathy and Kate to hear more about Twist Collective! Rowan Valley Tweed– on sale in May! HiKoo Kenzie– on sale in May! Lorna’s Laces Shepherd Worsted– on sale in May! Debbie Bliss Aymara – on sale in May! Lana Grossa Bingo – on sale in May! This entry was posted on Saturday, May 5th, 2018 at 8:01 am	and is filed under Uncategorized. You can follow any responses to this entry through the RSS 2.0 feed. You can skip to the end and leave a response. Pinging is currently not allowed. Q: Who may conduct gaming events such as raffles, casino or Las Vegas nights, or poker tournaments? These groups are qualified nonprofit organization and represent limited exceptions to the general law prohibiting gambling in the Commonwealth. I will check your site again Wed 5/9, and if changes have not been made I will report this to the Atty Gen’l. I am part of a group that watches the internet for illegal raffles. We try first to contact and educate the promoters, but where no change is made, we contact authorities. Raffle laws protect and reserve this income source for charity. Honestly, I would have expected a business of this size and experience to more aware of the laws. This is an in-store gift-with-purchase giveaway event – which we often have, as referenced here on our website, and not a raffle. It is a gift to our customers who stop by our freestanding store. We will not prevent a customer from coming to the store and just asking for an envelope. If you would like to discuss the matter further, I invite you to email me directly at mfleming@yarn.com or call my extension. Your original description “Shop in the store, and when you check out, you’ll receive a sealed envelope …” does not mention that envelopes can be requested without purchase. Even though the envelopes themselves are not “sold” as tickets, requiring a purchase to gain an entry still constitutes a raffle. As long as there is a free method of entry, it is not a raffle. Thanks for clearing that up, and perhaps you should remember to make that statement in your original announcements. Sorry to have to be anonymous, but we’ve had members threatened before, though I know you would not do that.